If there’s one place you’d expect to find fantastic deals on cell phones, you really don’t need to step outside your from door seeing that your online connected computer is a virtual store in itself. Continually being a hub for the best deals online, Amazon now has an amazing offer if you still have a fancy for the original HTC Droid Incredible. Seeing that its successor is about to launch very shortly, Verizon’s HTC Droid Incredible is now selling for the oh so easy to buy price of merely a penny with your signature on a 2-year contract. That’s right, you’ll be able to pick up one of the first devices to really give a sense of speed to the DROID branding. Naturally, the price point is more that fitting seeing that the HTC Droid Incredible 2 is going to launch at $200 on-contract – which makes this deal with Amazon pretty incredible on its own. Sure it may not have the contemporary specs of some its newer Android brothers and sisters, but seeing that it’s still one capable phone of delivering a phenomenal experience, you really can’t count this one out just yet – or maybe you can? 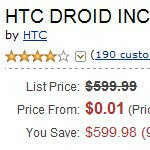 I the droid incredible is 1 penny, then how much more can the droid incredible 2 be worth with similar specs... 2 cents.